The Co-op began as a member run store with a part-time manager. Volunteer participation is not required but is encouraged. Typical jobs are Open Hours Host, various regular upkeep activities, bagging bulk items, unloading and stocking deliveries, picking up orders on the island or on the mainland, copying, repairs and maintenance. New Board Members are selected by the membership at the Annual Membership Meeting. They serve two years, usually with three or four new members voted in each year. The Board meets once a month. Its role is one of oversight: making sure the Co-op’s mission is fulfilled, establishing policy, monitoring the fiscal health of the organization, and long-range planning. The Board establishes committees for various ongoing or one-time endeavors. Both members at large and Board members may participate. Learn about the state of your Co-op, what’s new, what is planned. Vote for Directors and on other matters of interest to everyone. Each Household Membership casts one ballot. Interested people can meet to review members’ suggestions for products they would like to see at the Co-op, evaluating new items according to a list of criteria. 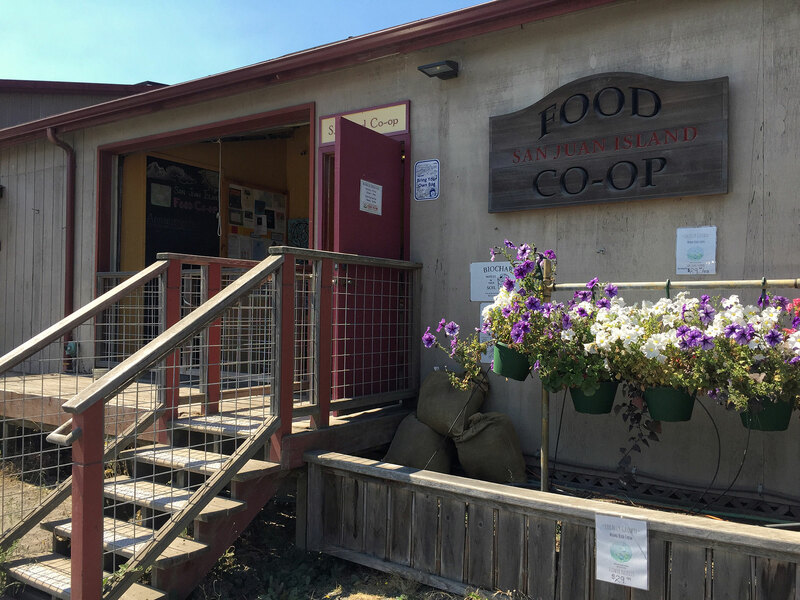 Buying guidelines for products at San Juan Island Food Co-op–three of four criteria to be met: 1. Selected using careful evaluation of sweeteners, preservatives, additives, and flavorings. 2. Grown or produced using organic practices, including non-GMO, and provided by a trusted source. 3. Locally/ regionally grown or produced. 4. Packaged and shipped with minimal impact on human health and the environment. Members are welcome to place special orders for items not on our shelves by adding to the Co-op’s weekly or bi-monthly orders with our two main distributors, UNFI and Azure Standard. The special order markup is than the store’s shelf prices. If you are interested in placing a special order, please pick up a special order instruction sheet at the Co-op or contact us for instructions. Where do the Co-op’s Local and Regional foods come from? The Co-op’s purpose is to support local and regional farmers and food producers. Our Island farmers and chefs deliver fresh food to the Co-op every day, and we make regular trips to the mainland for additional Skagit Valley farm products. Our sales continue to grow. The 2012 percentages are 32% local, defined as San Juan County, and 22% regional—mostly Puget Sound region but including Washington, Oregon, and British Columbia. These regional amounts reflect items procured directly from producers. In addition, however, a very large amount of regional shelf and cooler stock comes to us through our distributors, UNFI and Azure Standard, and Hummingbird Wholesale in Eugene—beans and grain products, chocolate and ice cream, tofu and frozen produce, dairy and beverages, for example, making our regional totals far greater. We put our food $$ right back into our economy by supporting producers from San Juan County, nearby Puget Sound Counties, Washington State, and our neighbors, Oregon and British Columbia. Eat well! Eat local! Support the Co-op’s Mission! You don’t see something you would like us to carry? Write a little note, including name of the product, the producer, manufacturer, distributor, and put it in the Suggestion Box at the Co-op. We make buying decisions based on our evaluation of sweeteners, preservatives, additives, and flavorings; organic practices and GMO status; where produced, favoring local/regional; sustainable packaging; and sales record in our store. Anna, the Manager, pins up responses to suggestions on our bulletin board, explaining when an item will be stocked or why it doesn’t fit our co-op’s mission. If the Co-op decides not to carry something you like, you can special order it for yourself from UNFI or Azure Standard with the store’s regular orders. How does the Co-op choose what new foods to carry? The Manager chooses new items based on a broad range needs to suit typical shoppers’ cooking and snacking needs. Our Food Forum meets monthly to discuss and research new products. All members are welcome to participate and to help us ensure that the items we carry are in line with our mission of local, regional, organic and/or sustainable growing practices. Contact us for meeting times. How can I post events/pamphlets on the bulletin board? Put your dated poster with a sticky note containing your contact information in the basket on the office door. We’ll hang it up if it fits our policies. If your event has something to do with food, we will want it there. In other cases we’ll make a case by case decision.